Most people know that they want to avoid both plaque and tartar, but they are not usually aware of the differences between the two. However, there are several important differences that must be understood in order to keep your teeth clean and healthy. Here are some of the basics about plaque, tartar, and their causes as well as prevention tips to help you make the right decisions for your teeth. Plaque is a colorless, sticky film made of bacteria. It forms on your teeth and along your gum line over the course of the day. Every time you eat, the bacteria on your teeth produce acid that erodes your teeth. This is what is known as plaque. Tartar is what happens when you allow too much plaque to accumulate on your teeth. When tartar sits for too long, it begins to harden and becomes calcified, attaching to the enamel on your teeth. The longer tartar sits, the more difficult it becomes to remove. If you let it harden too much, it can only be removed by a dental professional. Tartar can cause cavities as well as discoloration and gum sensitivity. It can also lead to more serious issues like periodontal disease, so it is important to pay attention to plaque and tartar buildup. Everybody will develop plaque throughout the day. If you run your tongue across your teeth and feel a fuzzy film on them, you are feeling plaque. It is not easy to see, but you can generally feel it in your mouth, and too much of it can lead to gingivitis and other uncomfortable feelings. Tartar is a mineral buildup, so it is usually visible on your teeth. You may see a yellow or brownish discoloration at your gum line or between your lower front teeth. This will feel more firm and tangible than the “fuzziness” of plaque. The main cause of excessive plaque and tartar buildup is a failure to properly take care of your teeth. After we eat, the bacteria from our food makes acids that begin to eat away at the enamel on our teeth. As tartar forms, plaque has more surface area on which to develop, leading to even more tartar and worsening tooth conditions. Thus, it is a vicious cycle that can rapidly decay your teeth and lead to other dental issues. The best way to prevent the buildup of plaque and tartar is to brush thoroughly at least twice a day. This means brushing for at least 2 minutes to ensure that you cover as much ground as possible. You should also floss at least once daily – twice if you are able to. This helps to immediately remove anything that may have been left by your meal. 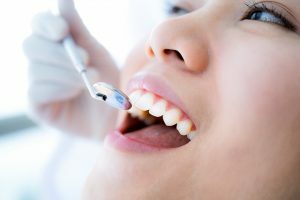 Be sure to schedule at least 2 dental visits every year for a deeper, more thorough cleaning that will take plaque and tartar removal one step further. To learn more about treatments for plaque and tartar, contact Dr. Keith Schwartz to schedule your appointment today!